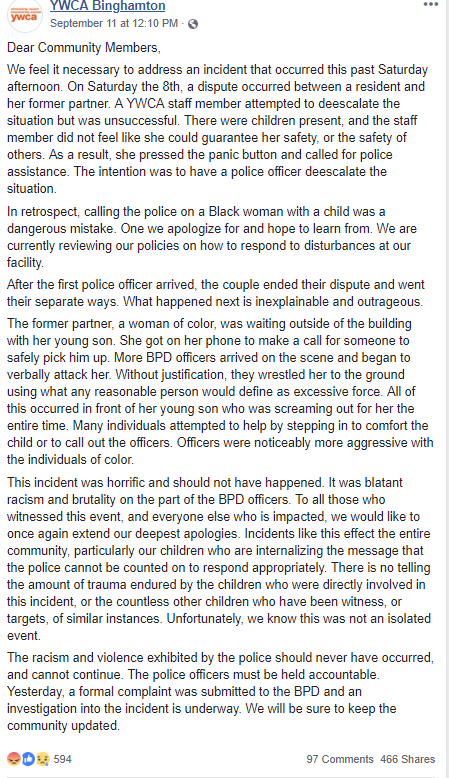 YWCA Apologizes To Binghamton Police, Retracts Accusations of "Blatant Racism"
The YWCA issued an apology to the City of Binghamton and its police department after accusations of "blatant racism" were made on the organization's Facebook page on September 11th. That post was made after officers responded to a domestic incident at the YWCA Hawley Street location on September 8th. The letter was sent by the YWCA Board President, not the Binghamton YWCA Executive Director Carole Coppens, who has so far declined to comment on the situation, but who police requested a public apology from. The Facebook post that made accusations against Binghamton police officers alleged excessive force and racism when they arrested a woman outside the YWCA building after employees say the woman got into a domestic dispute with her partner inside the secure lobby. In a press conference where Police Chief Joseph Zikuski, Binghamton Mayor Rich David, and Broome County District Attorney Steve Cornwell all said their investigations concluded no wrong-doing on the part of the police, Zikuski explained that his officers were required by law to make the arrest due to charges being pressed by both the victim and the YWCA. Investigations included a review of security camera footage both inside and outside the YWCA as well as footage from the responding officers' body cams. Now, with this apology, the YWCA says they agree with the conclusions of all the other investigations that the officers responded appropriately to the situation. The original Facebook post has been deleted, but a screen capture can be found below.